This is a rare late pastel by Hugh Douglas Hamilton executed towards the very end of his life when he had returned to Ireland from Italy. Early in his career Hamilton had devised a popular – and lucrative – format of head and shoulders portraits in pastel. Like so many other artists trained at the Dublin Society Schools, Hamilton was highly skilled at working in chalk from an early age. Strickland defines these pastel works as ‘faithful likenesses, full of expression and charm’; Mulvany records his success with them: ‘He could scarcely execute all the orders that came in upon him and the writer has heard him declare, that in the evening of each day, a part of his occupation was picking and gathering up the guineas from amongst the bran and broken crayons, in the several crayon boxes, into which, in the hurry of the day, he had thrown them’. Among these early pastels are many of the Conolly family of Castletown and the FitzGeralds of Carton. After a period in London, Hamilton moved to Italy where his style became more rigorously neo-classical; his subject matter extended to history painting as well as portraiture and he began to experiment more frequently in oil paint. 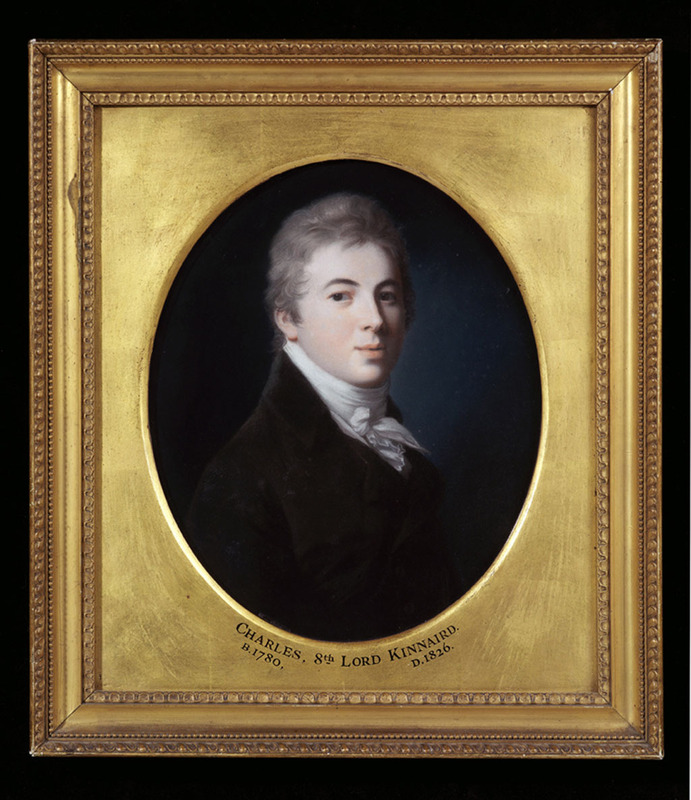 However, he continued to work in pastel producing handsome portraits of the 4th Earl of Guilford (National Gallery of Art, Washington), Jonas Langford Brooke (private collection), and, of course, his most famous work showing Canova in his studio (Victoria and Albert Museum). As with his later oils, Hamilton, reflecting the change in fashion of the turn of the century, largely eschews colour in favour of a pared-back monochromatic elegance. If his later style is accordingly less decorative, it more than compensates for this in greater psychological acuity. This portrait of Lord Kinnaird, previously unknown, can perhaps be best compared with his oil portraits of Lord Castlereagh (Mountstewart, County Down), James Moore O’Donel (Ulster Museum), and Richard Edgeworth (National Gallery of Ireland); the last of these, dateable to about 1800, shares with our work the forceful directness of the sitter’s gaze and a similarly robust approach to physiognomy. This dating on stylistic grounds can be confirmed by the approximate age of the sitter who seems to be in his early twenties. Hamilton’s subject here is a Scottish aristocrat, Charles, 8th Lord Kinnaird, who married into the family of Ireland’s premier peer – the FitzGeralds of Carton, Earls of Kildare and Dukes of Leinster. Born on 12 April 1780, and educated at Eton and the universities of Edinburgh, Cambridge and Glasgow, Kinnaird was admitted to Lincoln's Inn in 1799. He studied further at Geneva between 1800 and 1802, before taking a seat as Member of Parliament for Leominster in the latter year, being politically aligned with the Foxite whigs. On his succession to his father’s title, he was a Scottish representative peer from December 1806 to June 1807. On 8 May 1806 Kinnaird married Lady Olivia Letitia Catherine Fitzgerald (1787-1858), youngest daughter of the 2nd Duke of Leinster and his wife, Emilia. By Lady Olivia, Kinnaird had three sons and two daughters. In 1807 he began the construction of Rossie Priory in the Carse of Gowrie, Perthshire. Kinnaird travelled extensively on the continent and was an avid art collector, taking advantage of the sales of paintings dispersed during the Napoleonic wars, notably that of Philippe Égalité, Duke of Orléans. He owned works by Titian, Poussin, Teniers and Rubens, as well as fine classical sculpture. Kinnaird died on 12 December 1826 in Regency Square, Brighton. Hamilton was an obvious candidate to paint Kinnaird after the latter’s marriage to Lady Olivia. He had first worked for the Kildares more than forty years earlier, collaborating on John Rocque’s survey of the family’s estate at Kilkea. Hamilton was to paint no less than four generations of the family including the 1st Duke’s mother and the 2nd Duke – the father-in-law of Lord Kinnaird. More specifically, Strickland records a portrait by Hamilton of Lady Olivia FitzGerald, Kinnaird’s wife. This fine pastel, then, is almost certainly connected with Kinnaird’s marriage into the FitzGerald family and can accordingly be dated quite precisely to about 1806, making it one of Hamilton’s very last recorded works. In his later years, Hamilton had largely forsaken art for the study of chemistry, clearly, however, he came out of retirement to portray this new member of Ireland’s leading aristocratic family, his loyal patrons since the earliest days of his career.